Connors loyalty to Roddick was questioned. So far, it’s unclear as to how all of this came down: a few days after Maria Sharapova announced that Thomas Hogstedt had told her he no longer wanted to travel as much as she wanted him too and the two agreed to part, she hired Jimmy Connors, whom she has worked briefly with before, but whom had shown little indication that at the age of 60 he wanted to get out there and coach again. Connors had one serious stint as coach, with Andy Roddick from July of 2006 until just after the 2008 Aussie Open, which was coincidentally won by Sharapova just weeks after she had spent time with Connors in California during the off season honing her groundstrokes. Connors did a terrific job with Roddick at the start, somehow how clapping hard enough to encourage his steed to win 2006 Cincinnati and then reach the US Open final, a tournament in which he screamed and yelled to everyone that he was back as primetime player after an awful season at the majors, that he was never really out of contention and could still win Slams. He looked that part against many players, except against Roger Federer, who schooled him in that US Open final. Sharapova has yet to state how much the 60-year-old Connors will travel with her, but it won’t be to every tournament. Perhaps he will do so this summer, but he won’t in the fall when she heads to Asia. So it’s also possible that an assistant coach will be hired, unless she feels she is at the age where she can coach herself away from the majors with the aid of a hitting partner. That’s entirely possible. Almost every time that the reason “he/she doesn’t want to travel as much anymore” or wants to :spend more time with his/her family” is mentioned in relation to a coaching split, the presumption is that something else occurred. In the case of Hogstedt and Sharapova, the student is claiming that is exactly what he told her. He is at the age where the travel could have been wearing on him, but did he just say that because he wanted out of his contract? It’s possible, because as well as the Swede did with her in 2012 and for much of this season, (he did lead her to her sole post-shoulder surgery Grand Slam title at the 2012 French Open) he may have been stung by criticism that the strategy he encouraged her to take against Serena Williams was often ill thought out, either that or it was that she was not absorbing what he was saying anyway, neither of which are positive scenarios. She did play Serena close in the Roland Garros final, but her second round loss to Sharapova at the hands of Michelle Larcher de Brito in the second round of Wimbledon couldn’t have thrilled either of them. But to the point of quitting? Likely not. It appears that both of them have been considering the split for a few months. Now Hogstedt is welcome to field other offers and apparently there is a lot of interest from Caroline Wozniacki’s camp and given that he was reasonably successful with both Li Na and Sharapova, he might be good fit, although the Dane is a different type of personality and player than those two and not nearly as mature – yet. Almost without question, Sharapova is paying Connors huge money, as he always demands a of lot cash for his work and when she did train with him for a few weeks during the 2007 off-season, she was said to have paid the eight-time Slam champ a barrel-full of cash. In fact sources say that the reason why they didn’t continue some kind of relationship after that was largely because of money. 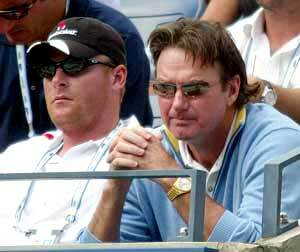 But Sharapova likes Connors resume, how he communicates and he motivates her and since she is not paying another full time coach and a half like she was back then with her father Yuri and Michael Joyce, Connors must be more affordable this time around. Plus Yuri is taken with him and although her dad is out of the traveling picture, he is very much still a part of her life and don’t think that his opinion doesn’t matter at all. But exactly what can Connors do with the veteran player at this stage in her career? Improve her net game? Doubtful given that she is almost allergic to the net and he was mediocre volleyer to start with. Make sure she stays aggressive? That’s never been her problem. Improve her second serve? Given that his was fairly weak that also seems improbable. Make her believe that she really does has the weapons to consistently beat the talented younger players like Victoria Azarenka and has the tools to upend Serena? Yes, that is where his talent lies in convincing great players that they still have big titles in them and they have nothing to fear from any other player. At least for now, Sharapova is being pretty close-lipped about the hire and the split with Hogstedt and until she speaks to the issue in eight days or so at the Bank of the West Classic at Stanford, nothing definitive can be written about her exact reasons. But when she meets Williams again – whom she hasn’t beaten since 2004—we will discover just how much he’s been able to boost her confidence. Serena is Connors’ and Maria’s litmus test. And if Sharapova can’t pass Connors’ test of being a real contender for No. 1, will he fly the coop like he did after a year and half with Roddick? You can bet that Maria asked him that.